Jess Tibbits , a beauty journalist at InStyle Magazine, and one of Lara’s very best friends from University, held a beauty sale on 4th July. “Lars was a real lipstick lover (and rocked a hot red like no one else), so the InStyle beauty team doned their brightest lippies and sold products in aid of Lara’s Foundation raising a lovely£250! 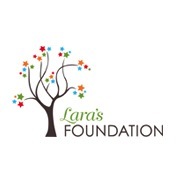 New Lara’s Foundation logo launched! Today, 15th July 2012, Lara’s 27th Birthday, our new Lara’s Foundation logo is released to the world! It has been created by our wonderful sponsors Riot Digital, and Nick Panayi of Sideshow London. The tree element of the logo is based on a design which Lara had tattooed on her wrist when she was living and teaching in Colombia. Stars were a big part of Lara’s life, so naturally they had to be incorporated into her Foundation’s logo! Not only did she love to star gaze, as she did in the Atacama desert in Chile, but she always added a 5 point star to all her correspondence, cards, stationery and just about everything else! We think our new logo is a beautiful incorporation of both of these elements and we are certain that Lara would approve. We are thrilled with it and we hope you love it too. We’ll be having tote bags, T-shirts and all sorts of exciting branded fun stuff printed soon!